THERMAL SUPPLY RECEIVES 2014 HAROLD V. GOODMAN AWARD. Goodman Manufacturing Company, L.P. is proud to announce that Thermal Supply is the recipient of the 2014 Harold V. Goodman Award. Thermal Supply is an independent distributor of Goodman, Amana® brand and Daikin HVAC products and is headquartered in Seattle, Washington. 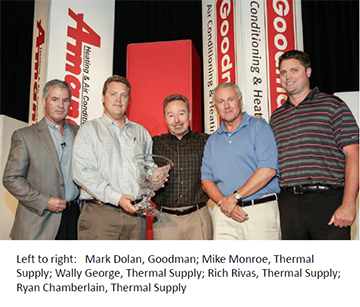 Thermal Supply has been a Goodman distributor since 1992. Starting from two locations in the early 1970’s, owner Bob Monroe grew Thermal from 2 locations to 12. When he retired in 1992, sons Mike and Dan Monroe took over, switched to Goodman, and have since grown the business to 24 locations in the Pacific Northwest, with locations in Washington, Oregon, Idaho, Montana, and Alaska. Thermal Supply has driven additional market share and sales growth recently by focusing on the Amana® brand of high-efficiency systems, with substantial sales of 14+ SEER condensing units and 95% efficiency furnaces. This year, they also brought in the premier Daikin ductless product line, and have already become one of the largest Daikin ductless distributors in the Western United States. Co-owner Mike Monroe states, “We are honored to receive this award. Moving to Goodman is one of the best decisions we ever made. I am also pleased that Goodman and Daikin have joined forces. Goodman has been the leader in the United States for years, and Daikin has that leadership position globally. The synergy of this company is just fantastic, and it‘s a great time to be a distributor for Goodman, Amana and now Daikin”. Goodman designs, manufactures, markets and distributes a complete line of residential heating and cooling systems. The products are manufactured in facilities located in Houston, TX, Fayetteville, TN, and Dayton, TN. For additional information, visit www.goodmanmfg.com. As the innovative manufacturer behind the world’s first walk-in cooler and the Radarange® microwave oven, the Amana brand has long been an American institution. And the same commitment to quality and innovation behind Amana brand home appliances goes into the Amana brand heating and air conditioning equipment. In fact, we design, engineer and manufacture all Amana brand heating and cooling systems with the goal of becoming the standard-bearers for premium performance, long lasting reliability, and a great match for your specific indoor comfort needs. For additional information, please visit www.amana-hac.com. Daikin Industries, Ltd. (DIL) is a Fortune 1000 company with more than 50,000 employees worldwide, and is recognized as the largest HVAC manufacturer in the world. Daikin North America LLC (DNA) is a subsidiary of DIL. DNA and its affiliates manufacture heating and cooling systems for residential, commercial and industrial use and are sold via a select group of independent HVAC contractors. DIL manufacturing operations include facilities at Houston, TX, Fayetteville, TN, and Dayton, TN. For additional information, visit www.daikincomfort.com.